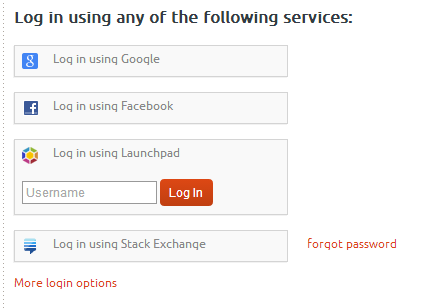 One of my coworkers noticed that Launchpad logins are broken. If you log out, then go to login, click the launchpad button, and nothing happens. Normally a text widget shows up so you can type in your username and then login. Works on Chrome for Windows but neither Chrome or Firefox in Linux. Can anyone else confirm this? I can confirm the behaviour but it isn't terminal. 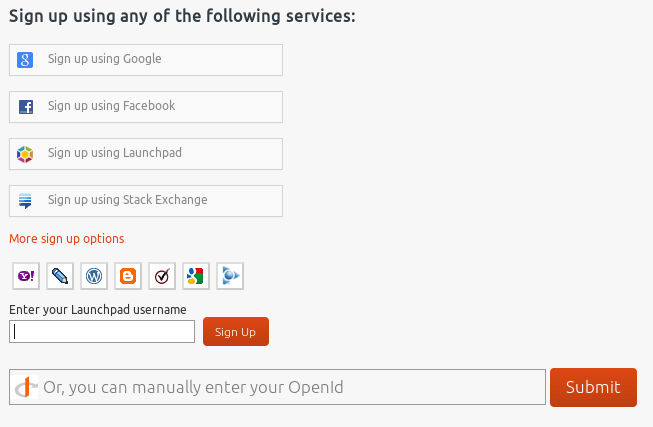 If you click the "More sign up options" link and then click the "Sign up using Launchpad" link, you'll get a textbox that will pre-populate the OpenID box for you and will forward you onto Launchpad. It's definitely a problem though. I'll punt this off to SE directly. Update: It's been handed from SE mods to developers. I or they will let you know when this is fixed. Not the answer you're looking for? Browse other questions tagged bug status-completed login launchpad . We have a launchpad team?